Preliminary design drawing for Battleship # 40, which was planned for construction in Fiscal Year 1915. This drawing provides a design that reflected the decision by the Secretary of the Navy on 3 January 1913 that Battleship # 40 would replicate the Battleship # 38 design (see Photo # S-584-041), with the exception that the 14-inch guns were to be mounted independently rather than in single, three-gun sleeves, which could not elevate guns singly. This design was 5 feet longer and 1,000 tons heavier than Battleship # 38. 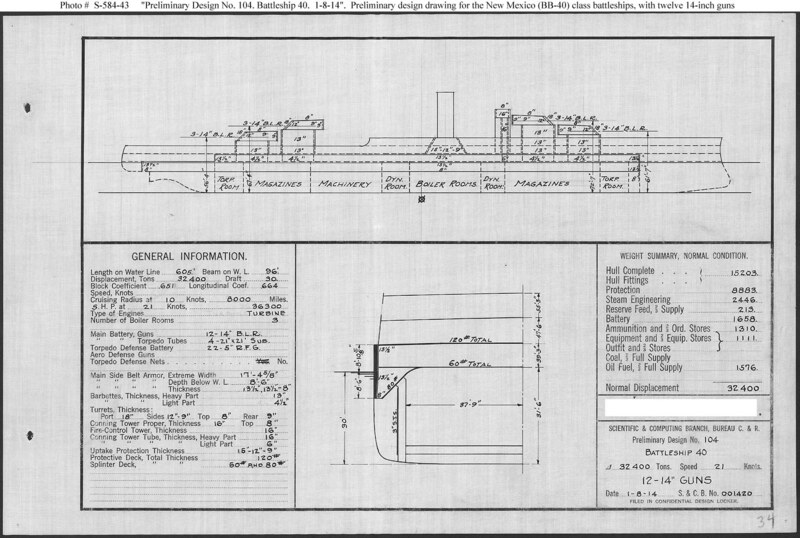 This plan provides twelve 14-inch guns, turbine machinery, and a speed of 21 knots in a ship 605 feet long on the load water line (L.W.L. ), 96 feet in beam, with a normal displacement of 32,400 tons.